On a mountain lot surrounded by lush & nature. Searching for the perfect luxury romantic getaway in Pinnacle Vista? The Mountain Romance cabin in Galtinburg is secluded yet close to everything romantic: The Space Needle a 400 foot glass elevator that offers a bird’s-eye view of our pretty city. Ride the free Parkway Trolley, grab your special someone by the hand and ride around our beautiful city. Snuggle up on the Aerial Tramway where area views don’t get any better. Wish for a kiss at the Village Fountain. You get the idea; Romance will definitely be in the air. Inside, the amenities of Mountain Romance will set your heart a flutter. The table is set for love in the well-stocked kitchen (cook a romantic meal for your partner). Plan on spending a few evening around the Fire Pit, or in front of the Fireplace. 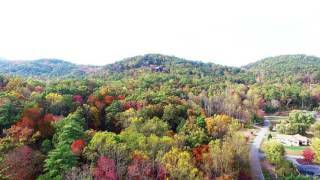 The hot tub faces the amazing Great Smoky Mountains and offers lots of bright reds, golds, and yellows in Fall. There is an upstairs loft. Sleeping arrangement: Entry level romantic king-sized log bed. Plus a sofa sleeper. Mountain Romance cabin actually sleeps 4, so if you want to bring friends/kids along, there is space. Couples and families will love the electric fire place, pool table on the second floor, and access to a public swimming pool and golf course! Being close to downtown Gatlinburg, TN has many advantages. Take a family stroll the beautiful River Walk, kids will love the Gatlinburg Candy Shop. If you are celebrating a honeymoon, anniversary, or just a spur of the moment romantic getaway - Gatlinburg, TN and the Smoky Mountains is one of the most romantic places in the world. We suggest a visit to Believe it or not, Ripley’s Aquarium of the Smokies - it is one of Gatlinburg’s most romantic places (experience the sensation of being under the sea). In fact, the Aquarium hosts numerous weddings every year! Since you book directly with us here at Pioneer Vacation Rentals, we can share local knowledge that meets your “couple’s wishes.” For a fun date night, stop by the Ole Smoky Moonshine Holler, Tennessee’s first legal moonshine distillery (if you think you need a little liquid courage for that first kiss). Toast that special someone in Gatlinburg! When it comes to relaxing wilderness experience on horseback, we suggest Sugarland Riding Stables. Explore hiking trails and experience scenic drives in The Great Smoky Mountains National Park - the most popular National Park in the country and is famous for its magical, smoky haze. Mountain rivers, Cades Cove, Little River Road. Ever wonder which hiking trails our guests enjoy the most? Chimney Tops Trail, Alum Cave Trail to Mount LeConte, Clingmans Dome Hike, Rainbow Falls Trail. How about the best scenic drives? Newfound Gap Road - 31 Miles of Incredible Mountain Landscapes, and Roaring Fork Motor Nature Trail - A Waterfall Wonderland. $140/nt to $170/nt. not including taxes and fees. 3 night minimum.